Guestbook - Sliding Door Repair? Call Arizona Sliding Door! Welcome to Arizona Sliding Door Co’s guestbook. If you have received repair services from Arizona Sliding Door Co, please leave your comments below regarding our service and quality of repair for recommendation to others. Your comments are greatly appreciated. You can login in with your facebook or other id, below. Again, thank you. These people are great! Quote over the phone, on time, lower end of the bid. I really thought this sliding door couldn’t be saved but it works great, just needs some cleaning. Thank you!!!! Called a handful of companies and found that Heather was so knowledgeable and took the time to explain everything, I selected them on this basis! Our 3 sets of sliders have never been serviced since they were installed in 2005. When we bought the house last year we needed 2 hands and all our strength to open the doors except for one which the previous owner used, but still not easy to open. When the door rollers were replaced and tracks cleaned and other tweaks made, all doors now open with two fingers and a wrist movement…SOOOO smooth!! When the work was done all we could say was “just like butta”! These guys should adopt his slogan for their marketing ….we are sooo happy!!! Great job! Called for service. Heather was very knowledgable and explained the entire process as well as a price range I could expect. Imagine my surprise and delight when it actually came in at the very bottom of that price range! Door works great now, have to be careful not to throw my back out expecting it to be as hard as it used to be. I would like to thank Dave for a job well done. I’ve been dealing with this sliding door for months and he fixed it in about 15 minutes. Just wish I had called sooner. Very professional and excellent work. I highly recommend Arizona Sliding Door. Thank you Jason!! Job well done Very professional work ethics. You made my sliding door like new again. Outstanding service and exceptional quality! My wife and I have been living with sliders needing new rollers for years. One was so difficult to open and close we essentially abandoned it. We’ve had at least 3 service calls over the years from “so called” sliding door repair companies here in Tucson. Upon seeing our sliders all said they had never seen doors like our and would be unable to repair them. Then I saw an add for AZ Sliding Door Repair in the local Home Mag and set up a service call with Heather. To be honest, I was skeptical that this company could help us. Then Jason arrived, took a look at our doors, and told me he could fix them. He was polite, knowledgeable, professional, and he replaced the rollers on both doors in under an hour. We are very pleased. This is a great small business! Absolutely OUTSTANDING work by Heather and David! The entire process to repair our sliding glass door took only 45 minutes!! Works better now than when we moved in! The estimate was accurate, and the repair process was thoroughly explained to us prior to the work beginning! I highly recommend this company to anyone with a sliding glass door problem!! Whhhyyyyy did I wait so long to have Arizona Sliding Door come over? The entire process was painless from the phone call to Heather making an appointment to Jason arriving early (early is fine with us) and replacing rollers/checking over the entire door within about 30 minutes. Arizona Sliding Door is friendly, honest and efficient. We strongly recommend them. This company is great! I highly recommend them. Came in, got the job done, and were so clean and friendly. I called Arizona sliding door company from San Diego to repair my daughter’s door in chandler and gave them my credit card. I was given a 2 quotes for the costs since neither of us knew what the repair entailed . Dave came out in the pouring rain and repaired her door beautifully and when I got the bill it was for the lower amount quoted, He could of easily charged me for the higher amount but this company is so honest they didn’t. Thank you for your amazing service and also for your integrity. This is the company to use if you need your sliding door repaired! I would highly recommend this team! I called on Friday morning because our sliding door fell off the track and was stuck. They immediately called me back and came out to repair it within a couple of hours! They gave me exact costs over the phone and that is what I paid when they repaired the door. They are fantastic, you can’t go wrong using them! SO thankful for these good people and their great service! We had just bought a nice home in North Scottsdale- one of the few problems was the main 4×8′ slider literally took a linebacker to open or close it- otherwise a beautiful door and window system. Arizona Sliding Door was very helpful when I called to learn what they do and how much the repairs were likely to be. Their schedule was easy to work with. Dave arrived just as scheduled and fairly quickly performed a miracle on our main rear door, as well as another. Oh my what a difference- just like new! We very nearly started getting quotes on new doors that would have cost thousands- but of course, after finding AZ sliding door there is no need for that. Dave was friendly and outgoing, efficient and kept the work area tidy. Highest recommendation!! Dave did an excellent job on our patio door at a very fair price. They didn’t try to sell us anything we didn’t need and it’s like we have a new door! I would highly recommend the company if you need work on your sliding glass door or windows. Very honest and reliable. I have used Arizona Sliding Door three different times and have been very pleased with each. Dave knows what he’s doing and has had a solution for each problem. I highly recommend this company. Thanks Heather and Dave for your help in repairing our doors! We’re happy to help assist if you ever need your auto glass or windshield repaired on your work van, thanks! Arizona Sliding Door is wonderful! We are mad that we waited too long to have the door repaired. Heather explained exactly what to expect during their visit and the pricing over the phone, without having to get an estimate then wait for the job to be scheduled. They made it so easy! Dave was extremely knowledgeable, professional and fun! So glad you service Tucson as well. Thank you all for such great service! I am thrilled with their service. I called and was able to trouble shoot over the phone what the issue was. I was given a quote and today when the repair was scheduled he arrived early, was in and out in no time. Pricing was exactly as mentioned on the phone. I just had Jason out to look at my sliding glass door. What a wonderful young man! He had it fixed in no time! My door has never rolled this nice! Like Heather said, I can roll it with just one or two fingers! I like using local company’s, to help support the “little guys”, and our local economy. AZ Sliding Door is my go to in the future! Also, pricing seemed fair, thanks again! These two are my sliding glass door super heroes! I have used them twice for separate issues to my sliding glass door. Dave and Heather were able to figure out a cost effective and long lasting solution to my off center door due to my house settling. Most companies would have made this job much more costly and I feel confident that they were looking out for my best interest. *I believe in supporting small businesses and this duo is A+ in my book! Thank you Dave and Heather! Dave and Heather are great and I highly recommend them, highly knowledgeable and pleasant. When I talked to Heather she gave me scenario’s and the cost of each so I knew approximately what I would be looking at cost wise depending on what were the needs of the door. Dave arrived earlier than expected (which was fine with me) and looked at the door. Mechanics were fine with the door except for missing felt at the top. He gave me suggestions on where to get the replacement and left. He didn’t charge me a thing. It’s refreshing to find people who are not out to gouge customers. Thank you so much. Know that I will recommend you to others. Thank you both for making this experience a winning one. I loved how easy you both made everything: setting the appointments, fixing my door, ordering my new screen door and e-mailing me my invoice. I will highly recommend you in the future to anyone who will listen to me!! You both are great! Thank you Dave for a job well done. After struggling with a patio door for quite some time, Dave was able to repair the door in less than 15 min. I am now able to open and close the door with one finger. Heather was extremely helpful on the original telephone contact and assured me Dave would call next time he was in the area. He followed up as promised without further calls. Dave arrived promptly (early actually). The slider was an unusual 15 year old vinyl one that other repair companies stated could not be fixed and needed to be replaced. It took Dave a bit of time to figure out how to remove the door (required removal of the stationary door first). He removed it, put on new rollers, replaced and adjusted it. It has never worked this smoothly. Highly recommend Arizona Sliding Door! Excellent service in all respects! I had the best experience with Dave and Heather of AZ Sliding Door. I am so happy with how easily my door slides now! I had called another company to get an estimate on my giant sliding door. When they came out and looked at it they informed me that it was so big they would need three men to do the job. Later they called me back and said they couldn’t get the rollers for that size of door. I called AZ Sliding Door and Dave came out, looked at my door and said, “no problem.” He ordered the rollers and installed them. The door now slides so smoothly! Genuine, affordable, and knowledgeable–I highly recommend calling AZ Sliding Door first! I had 2 sliding doors that were in trouble – one at a home I rent out, the other in my own home. None of the local sliding door companies would even consider repair/refurbishment; they all seemed only to be interested in selling me a new $1500 sliding door. I live outside their usual service area, but Dave was travelling near my area and made the accommodation to come by and service the doors. My renters stated “Dave and Heather were very friendly and professional. The door now slides like it’s on ice”. Dave made a separate visit for the door on my home as he had to order parts for the old Anderson door. He arrived exactly on time, and was friendly and personable. He did a great job. It is nice to see a family run business with a great work ethic. When I first spoke to Heather on the phone and explained my needs, she immediately tried to work out a way to help me, even though I live outside their usual service area; this is a pretty unusual concept for many businesses today. I would definitely do business with them again. Excellent service and results starting with my call to Heather for initial information and scheduling and to Dave for repairing our two sliding doors. It is immediately obvious they care about their company’s reputation and the quality of service to their customers. Dave is very personable, knowledgeable and efficient. There is no need to look any further as Arizona Sliding Door is the company you want to call. I highly recommend this company for your sliding door repair issues. Dave was very personable, arrived before the scheduled time and did an excellent job. The wife will not have any issues with opening our sliding door any more. Would highly recommend Dave. Just moved into a home with 4 sliding doors. All of them took a mighty heave to open. Dave came out and fixed the main one. It slid so smoothly, I had Dave fix the other three at the same time. What a difference it made. Following week, I went to our son’s home, and lo and behold, another none slider. Made an appointment for Dave to go out to his home and fix it. Now the kids can open the door without bothering Mom and Dad. Great company, great service and reliable. Highly recommend Arizona Sliding Door. Polite, friendly, passionate, knowledgeable about their work. Really impressed with the total experience. Price was worth every penny. Oh and we don’t have to use a come along to close the doors now. They are gliding doors. Thanks Dave, Heather great job. Keeping it up. Highly recommend . Thanks so much for what you do. You are both a pleasure to work with and take so much time with your customers to make sure they understand everything that needs done. The work quality is top notch and the price was awesome. I’ll recommend you to everyone! We have a large 10ft sliding glass door that leads from our family room to the patio/pool. We have kids and pets. We are CONSTANTLY opening and closing this door. It was grating and rubbing along the track, but David came out and replaced the rollers and it glided along the track! He is prompt, professional, friendly and answered all my questions! When the door started to give us problems again after six months I thought I’d call again to see if he could come out and take a look. With a minor adjustment, it is gliding along the track with a two finger push again. Here’s the amazing part….he didn’t want any $$ for the repeat trip out!! Talk about backing up your work! I can highly recommend this company to family and friends! When you get awesome service like this, I made it a point to see if I could post a recommendation. Thanks David! Dave did a great job, he took my call set up an appointment at 5 pm on a Saturday after another company canceled on me. We had 2 sliding doors that were so tough to open that I had to have my husband open them for me sometimes. It was even hard to grill out because I would always struggle trying to hold the food, block the cats and get out of the sliding door at the same time; but tonight I can open the slider with my index finger…I am sooo happy!! Dave arrived 5 minutes early and had those doors ready to go in about half an hour….I can not wait to start using the grill again! I am sending your name to a friend of mine with cranky sliders 🙂 Thanks!! There are 3 sliding doors in our house that did not work correctly. Two of them were hardly ever used because the difficulty of opening them. Dave came in and took care of our problems and made sure we were thoroughly pleased with the service. It’s to bad they only work on the sliding doors because I’d have them build me a whole house. Our glass patio door was so heavy to open and close it was that way since we bought the house twelve years ago. It was literally a pain in the neck. My husband had neck surgery eight weeks ago and I had to come and open the door every time he wanted in and out. Today Dave came out and fixed it now it is light as a feather. I don’t know why we put up with it so long. I am so impressed they gave us quick service, very professional and reasonably priced. It is so nice to get great customer service. I will recommend them to all my friends and family. Thank you so much for repairing my sliding glass door. The amount of force it took to open and close the door I was sure that the patio glass door would require replacement. After getting quotes in the thousands of dollars I decided to look for alternatives. Dave came out on time and fixed my door better than it was when it was new. Now I can open and close the door with two fingers. Thanks so much the kids, the wif,e and me we are all happy. The best $150.00 dollars I have ever spent. I did not know my sliding door could work so good. Great friendly service. Before the repair my door felt like it weighed 200 pounds. It took my whole body to open it. Not it literally can open and close with one finger! Thanks again you guys are awesome! We’ve lived in our house over 18 years and the sliding door has never opened easily…until we called Dave. In no time at all he replaced the rollers and made some adjustments to the frame and the door slides so effortlessly now. 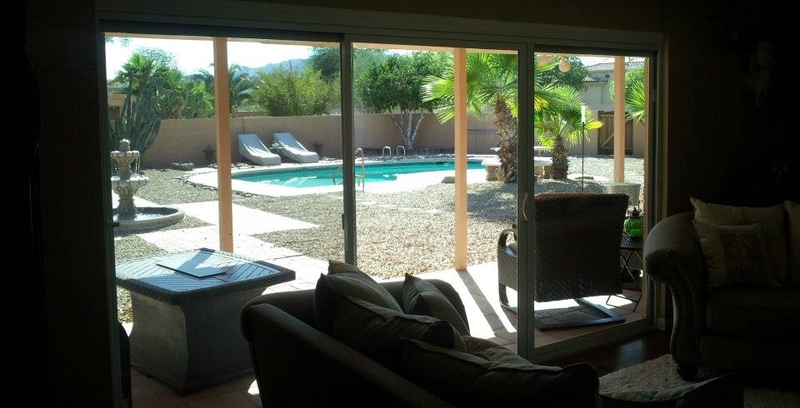 We highly recommend Arizona Sliding Door! Thank you so much for fixing our sliding glass doors and replacing our screens. We really appreciate your honesty and your great work. We would not hesitate to recommend you to our friends. The doors are so much easier to use. Thanks again! I had the automatic sliding door installed and what a wonderful addition. I enjoy it very much, especially when entertaining…no more doors being left wide open. 🙂 Thank you for the great service! I would highly recommend them to family and friends. Professional service, speedy repair, and great price…Highly recommended! Thank you so much for your help with our sliding door today…My wife and I thought that the door we had was a complete throw away and needed a new door…Instead, Dave came out and fixed the door and now it works like a BRAND NEW DOOR…Amazing….Again, thank you for coming into our home and helping us save time and money on the door. Dave and Heather, you came out in November 2012 and fixed our sticking sliding door and ever since it works great. We have shown our friends and they have gone to you as well. Thanks for the fast and great service. Our door has never worked like this !!! I had Dave & Heather come over to give me a price to replace a sliding screen door that I walked through. Dave mentioned how my sliding doors were hard to move and sagested a tune up. I told him that is how the sliders have always been. He replaced the kitchen screen slider and it looked so good I had him replace the master br screen slider also. I also had him and heather do the tune up on both sliders. “WOW” what a difference it made.Those sliders never moved so easy and smooth, even when the house was new. GREAT JOB DAVE & HEATHER . I have told my friends and co workers about your GREAD work. Thank you Dave and Heather for the AMAZING job repairing our sliding doors yesterday! We should have done it years ago. What a JOY to open the doors effortlessly. We will tell everyone we know about your great service. I will contact you about re-making our screen door later today. Looking forward to getting that done as soon as possible. Just had my appointment and the experience was great! Prompt, courteous, clean and great advice for keeping my door in great shape in the years to come! My door now works beautifully! I will definitely recommend ASD to friends and family. Thanks so much Dave and Heather! I originally clipped and saved an Arizona Sliding Door (ASD) ad from a local advertisement; however, I did not contact them until I ran across them again on Craigslist, and I’m glad I did. I contacted Dave my phone and scheduled an appointment to fix/repair my two (2) sliding glass doors. Dave and Heather arrived right on time the day of the appointment, and proceed to resolve the issues with my doors, which were difficult to open and close. They replaced the rollers, adjusted/tuned-up the doors, and now I can open and close them with one (1) finger! Their service includes a full 3 year warranty, and the price was as quoted. If you want your patio doors fixed right, I recommend Dave and Heather at ASD. I highly recommend ASD…!! Dave and Heather were extremely sensitive to the urgency of our needs. We called ASD after calling several other companies with disturbing phone attitudes and adjustable prices. I called ASD at 0930AM on a Saturday morning in a panic because tenants were moving in at 10AM and they were able to make it to our rental property within hours of calling them, with a professional attitude and extremely polite. They did not charge me for an emergency call, what they quoted me on the phone was the same charge once they finished the job. Thanks ASD for your help, our tenants can open this once extremely difficult sliding door with one finger…! We are very pleased with your services and will recommend you to others! I called Dave mid morning on 12/07/2012 and described the issue with my sliding glass door. Dave detailed what he would do to repair the door and quoted the price on the phone as well as what time they would be out to repair the door. Dave and Heather arrived on time, performed the needed repairs, upgraded to heavier rollers , “tuned up” the door and included a 3 year warranty on parts and labor all for the originally quoted price. Now my 92 year old mother-in-law is able to open and close the door with one finger. Thank you Dave and Heather for a great job! We will recommend you to all of our neighbors when they need door repairs. I don’t know how my husband found them, but their work is excellent and the price was great. Our door is older and we couldn’t find parts to do it ourselves. They found the parts and the door works great – takes barely any effort to slide it. We met Dave and Heather at the Home Show in SaddleBrooke. We hadn’t planned on doing anything with our two sliding glass doors and screen doors. But after speaking with them, seeing what they had to offer, and their prices all of the sudden replacing the screens and fixing the doors became a priority. A very smart move. They were there when promised, a bit early actually and they worked quickly and efficiently. We would recommend them highly. I have a double paned 8 foot door that is very heavy. You had to put your back into it and use both arms just to open and close it. One call to ASD fixed all that. Now I have to be careful not to slam it using 2 fingers!!! Great job, friendly, affordable, worth every cent, thanks! I highly recommend Arizona Sliding Door! I met Heather and Dave at the Quail Creek Home Improvement Show in Green Valley. My sliding door was very difficult to open and close. When they told me they could fix it … I admit I was skeptical. BUT I now can open/close the sliding door with one finger!! They are very professional, reasonably priced and do excellent work!! Thank you Heather and Dave! Came in the nick of time. Doors were wearing out. Now they are great. Slide with one finger. We met these two at the AZ Home Show a couple of months back and saved their business cards because they were so nice. We actually used them today and it’s amazing how much better the doors work. Everyday I keep saying I got to fix these *#%&^(* doors but never have. They were becoming so hard to close that it was time to see if we still saved the card. We did, we called they fixed it the next day and these doors slide like a hot iron on ice. Their prices were great and cheaper than a company i used a couple of years ago on another house we had. They are very friendly and professional and fast….what else can I say….They are also dog lovers! These guys are great! Dave and Heather made a last minute call to my house over the weekend and spent their evening fixing a rolling door that wouldn’t shut leaving my home totally exposed to intruders. They were timely and charged a reasonable price for their expert service. On top of that, they are as nice as people come. I highly recommend them for your sliding door needs. Arizona Sliding Door is the BEST! Our door now opens so easily. Talking to Dave and Heather was the best thing about the Phoenix Home and Garden Show. We wish we had met them sooner! I highly recommend Arizona Sliding Door!!! I called Dave and Heather and they were able to come the same day. They are very professional, they have the experience and knowledge to fix any sliding door problem and it was a very good price for all their hard work. They did such a wonderful job on my sliding door. In fact, I am not sure this door has EVER worked this good. We met Heather and Dave at the Phoenix home show. We were delights that they came to Maricopa and didn’t charge us for the travel time. Heather and Dave are friendly, HONEST and dependable. Their fees are very reasonable. We are very pleased with the repairs Dave made to our door. It now glides smoothly and locks properly. We HIGHLY RECOMMEND Arizona Sliding Door. We will be sure to spread the good word to our neighbors and friends in Maricopa. Thank you Heather and Dave and Arizona Sliding Door! My door was a serious drag to open. It took two hands as the rollers were completely shot. Dave came out and after spending time fighting a particularly difficult bolt, had the door working better than new. He was professional and pleasant to work with. Highly recommended! I highly recommend Dave and Heather at Arizona Sliding Door. Along with being such truly pleasant people to work with Dave is a true artist at his trade–dealing with problems professionally and easily. He had my problem door fixed in an hour and it now works like new. Really, really pleased with this company. Highly Recommended! Thank you for making my tenant happy and resolving the problem. You provided outstanding same day service. Dave left me with no other choice but to have my own sliding door fixed as well. What a difference! Dave and Heather came on time and corrected our sluggish door in a friendly professional manner. We can now enjoy using the door! Before thinking of replacing your slider, call them. The 3 year warranty and superb service, at a great price you can’t beat. I was so pleased to meet Dave, very nice, polite, and great with my curious little 1& 3 yr old girls. Our sliding glass door has always been hard to open but the other day I almost got stuck outside. Dave came to the rescue and replaced our wheels and a few other parts the door works like a brand new door and it is at least 15 yrs old! Thanks Dave! I would highly recommend them to my friends and family! We wanted to change our sliding glass doors to open from one side to the other. OMG! They came in, examined the doors and said they could do it right now. In less then an hour the doors were changed and sliding very smoothly. I was very impressed!! Also had a subborn kitchen window that they also fixed. I would have them out anytime!! OMG I never thought a sliding door could work so well. Thank you Dave for your fast and competent service. We would definitely recommend your company to all. Now thinking about a screen door which Dave showed us the high quality and craftsmanship. Thank you so much for making life easier. They couldn’t have been better.I really appreciated their honesty, positive attitude, and hardwork. They showed up right on the dot and accomplished exactly what they said they would, even with my dog barking at them. Look no further and hire Dave and Heather! Heather and Dave were here today and one of our sliding glass doors was repaired in under an hour with no surprises. It now works better than it did when the house was built 8 years ago. We look forward to working with them again. Great service and their warranty provides good piece of mind. Dave & Heather were here today to work on 2 of our sliding doors. Our house is 16 years old and they are the original doors. They work with such a terrific attitude and do good work. I highly recommend them. They did a great job. Dave was very helpful in fixing my glass slider. I don’t think the slider ever glided so smooth and the house is only 6 years old! I would reccomend them to anyone. Dave and Heather did an excellent job on our sliding door repair. We would recommend them to all. We will also be purchasing a screen door from them. Nice high quality product. Dave and Heather did a fantastic job on getting our sliding glass door to operate with the greatest of ease. They also replaced our old sliding screen door. Both jobs were done professionally and receive our highest approval. Heather and Dave are AWESOME!!! They came and fixed our sliding door and now it’s so much better! We are not affraid our door is going to fall off! Thank you guys so much!!!!! Great job on my patio door, Dave & Heather! My slider now glides smoothly, the way it should. No more struggling in order to let the dogs in & out. So happy I saw your ad! 🙂 Thank you! Our sliding door in our family room was very heavy and hard to open and slide. Dave Hoist, repaired the door and we can now open and shut the door with ease. We would recomend Arizona Sliding Doors and Dave anytime. Thanks Dave, you guys did a great job repairing the rollers on our sliding glass door. It works great. You were on time, you did a great job and you rprice was right. It was nice meeting both of you. I’ve already recommended you to a number of freinds. Thanks again. Wow! Dave did the impossible. He fixed an original 1950’s steel frame sliding door in my Arcadia area home! The manufacturer of the door is long gone and there are no replacement rollers for this type of door. Dave did a great retrofit. Thank you for doing what others would walk away from. Great Job! I’m Impressed! Great job fixing a very stubborn problem as well as pointing out the reasons for the hard-to-open door(s). No more need to get a running start to get the door to move and no more concern with breaking a knuckle while doing it. Thanks for making the trek to Saddlebrooke; we’ll be letting our friends and neighbors know how to get THEIR door problems remedied. Thanks Heather and Dave! Thank you Dave & Heather for taking care of my patio door glass. I am very please to have pick your company for replacing my glass and adding the double rollers. Really moves along smooth and the new glass looks great. You do excellent work & I will not hesitate in the future to call you back. To anyone that comes to this site, believe me you can not go wrong. You will get very informative and quality work. Thanks again. Thanks Dave for your exceptional service fixing my sliding door. It is rare these days to find someone with your “I’m not leaving this job until it is perfect” mindset. The door probably works smoother and more quiet now than when it was new. I’m sure the new screen door will be the same. I will use you for any future door needs. Thanks again. Thank you for the exceptional work performed on my doors. The new screen is awesome. Glad to meet you both at the Home Show. I knew, eventually, I would get the quality worksmanship and fair pricing that I expect. Keep up the GREAT work, you guys are AWESOME!! I will refer you when I can. Thank you. Thank you, Dave & Heather, for driving out to Maricopa to change the rollers on my patio door. Now, I no longer have to use both hands to open and close the door. One finger does it all. Woohoo!!! I was so impressed with your prompt, friendly, professional service and would not hesitate recommending you to others needing your service. Another satisfied customer. Thanks again. Dave & Heather, thank you so much for working with us to correct our sliding door issues. The fixed doors now work perfectly and the newly installed door is great! I will be sure to use you for any “door issues” in the future! Dave and Heather came out today for my door tune-up. Wow, what a difference. With spring here and summer right around the corner we no longer have to fight the glass sliders and screen doors to get to the pool or grill. Can’t tell you how many times the doors were just left open to avoid the hassle of closing them. Do yourself, friends and family a favor and have Dave and Heather come out and make your life a little easier and enjoyable. Don’t be locked in by doors you don’t want to fight with, life is too short! Thanks again AZ Sliding Door.